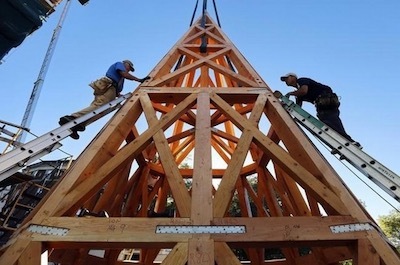 NEW BEDFORD — Restoration workers ran into a snag Thursday as they attempted to raise the framework of a new steeple at the Grace Episcopal Church. The two halves of the structure, top and bottom, balked as workers attempted to install the bolts and metal braces that hold the steeple together. One or two braces were installed as of 5:30 p.m., but with daylight fading the decision was made to call it a day and resume work on Friday at 9 a.m. The steeple replacement is part of a larger renovation project at the church; the portion that involves the tower is costing $1.2 million, raised through various means. But the project is running about a year late because once the old steeple was removed as too deteriorated, the belfry beneath it showed that it had been ruined by all the weight of the stone and brick steeple, said Charlie Capizano, the junior warden of the church, a job that puts him in charge of the building. The new steeple is wood and slate, and is much lighter. The belfry was demolished down to solid conditions and covered for the winter. Then it happened that the spring of this year was so damp that the stonemasons couldn’t get the right conditions for the mortar. Now that the project has reached the assembly stage, the long stretch in storage appears to have slightly changed the shape of the Douglas fir timbers, which fit together at the New Hampshire factory, before storage. Workers were hammering them back into shape Thursday. The intricately built steeple was designed and constructed with the aid of computer design software and computer-controlled woodworking machines. It is in two sections. The lower one was hoisted to the top of the tower and fitted perfectly there. It was then lowered to the ground and the top of the steeple placed upon it, when the problems became known. Once the braces are all installed, it will not be long before the steeple framework is complete and ready for wood sheathing and slate panels.